Posted on December 31, 2018 - By Fucosoft | Follow YouTube, Twitter to Get More Information. Apple’s newest iPhone XS (Max) comes with a dual-camera system incorporates the Image Signal Processor, Neural Engine, and advanced algorithms to help you take more amazing photos than ever. If you take lots of photos and videos with your iPhone, then you may want to transfer photos from iPhone to PC/Mac for safe backup and iPhone space clear. You’ve come to the right place. Here in this post, we’ll show you how to transfer photos from iPhone to computer. Whether you are using a PC or Mac, we’ve got you covered. Connect your iPhone or iPad to your Windows PC using a USB cable. Once Windows detects the device, AutoPlay will pop up and you’ll see different options. 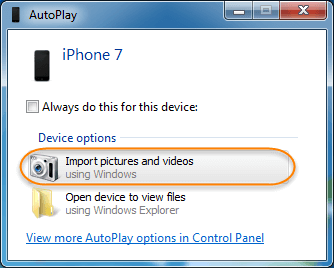 From the “Device” option, choose “Import pictures and videos”. Then choose the photos or videos you’d like to save to your PC. The photos will be saved to My Pictures by default. If you want to save them to another location, you just need to change the Import settings. Connect your iPhone or iPad to your Mac and open the Photos app if it doesn’t open automatically. The Photos app will show an Import screen with all the photos and videos that are on your connected device. 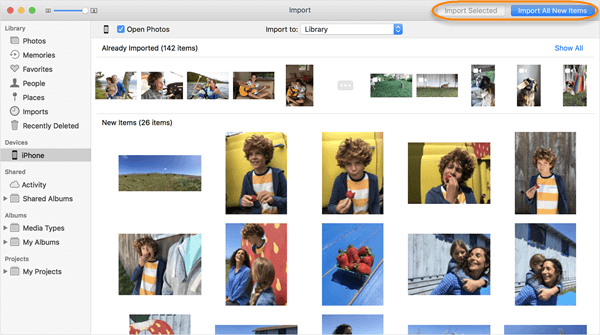 Select the photos you want and click “Import Selected”, or click “Import All New Photos” to save all new photos. Your iPhone photos and videos will be copied to your Photos Library automatically. You’ll find them in the “Pictures” directory. Both AutoPlay and iPhoto only support transferring Camera Roll photos from iPhone to computer. If you want to transfer all photos including Camera Roll, Photo Stream or Photo Library, you’d better use third-party tool like Fucosoft iOS Data Backup & Restore. This tool allows you to backup all photos from iPhone to PC or Mac in just one click. It works with all iPhones, like iPhone XS, iPhone XS Max, iPhone XR, iPhone X, iPhone 8/8 Plus, iPhone 7/7 Plus, iPhone 6s/6s Plus, iPad Pro, and much more (iOS 12 compatible). Download and install Fucosoft iPhone Photo Transfer on your computer. Launch the program and choose “Acquire Backup from Device & iCloud”. Click on “Back Up Device” and connect your iPhone or iPad to the computer with a USB cable. Click on “Make a Full Backup” and then “Back Up” to start transferring photos and videos from iPhone/iPad to computer. Except transferring photos and videos from iPhone to computer, Fucosoft iOS Data Backup & Restore also supports copying other iPhone contents, including messages, contacts, call history, WhatsApp, notes, calendar, Safari bookmarks, voice memos, voicemail, and more.